"My family loves this recipe! It is great on a snowy day when you need a whole body warm up and is VERY easy on your pocketbook. Serve over rice." Heat the oil in a skillet, and cook the onion and cabbage until tender. 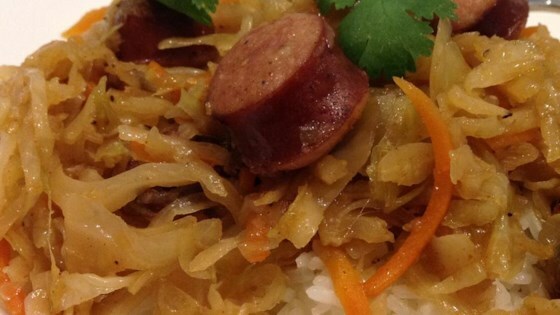 Place kielbasa over cabbage. Season with Cajun seasoning, pepper, salt, and Worcestershire sauce. Reduce heat to low, cover, and cook 20 minutes, stirring occasionally. See how to make a simple and comforting one-pot meal. Very good! Use a dutch oven instead of a skillet, though! Super easy and super fast. I served this dish w/ mashed potatoes and it was demolish by my sons and their friends.